With its 2100 W, Leader SMOKE 5 is able to generate a large amount of smoke in a short time. It is perfect for training in large volumes. For some very large volumes, it is even better to use multiple Leader SMOKE 5 rather than just one more powerful machine. The distribution system of Leader SMOKE 5 will allow a faster and more homogeneous smoke. 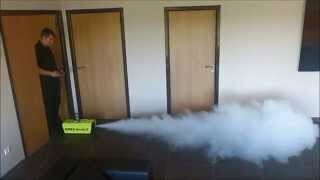 Leader SMOKE 5 generates dense, realistic smoke and is the perfect tool for evacuation drills and completely safe training. Discover the LEADER SMOKE 4, the old generation of LEADER SMOKE 5 and how to use it.